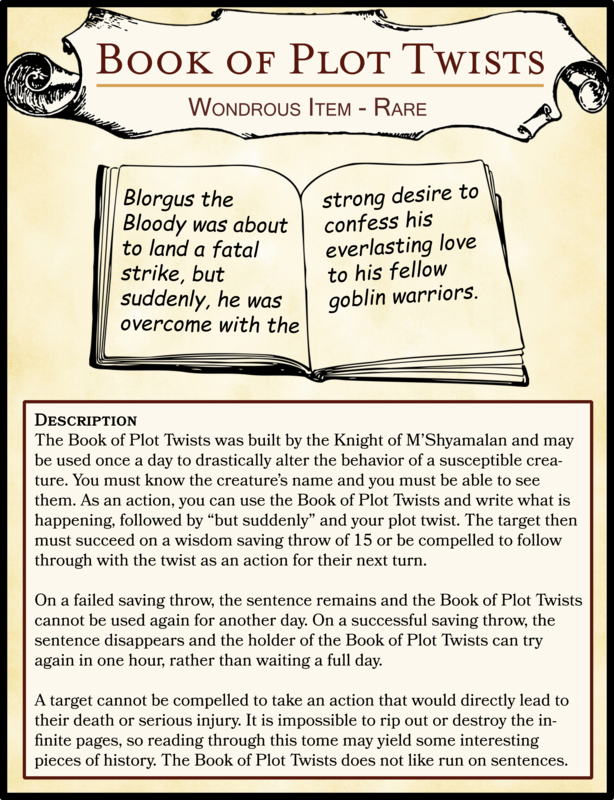 The Book of Plot Twists was built by the Knight of M’Shyamalan and may be used once a day to drastically alter the behavior of a susceptible creature. You must know the creature’s name and you must be able to see them. As an action, you can use the Book of Plot Twists and write what is happening, followed by “but suddenly” and your plot twist. The target then must succeed on a wisdom saving throw of 15 or be compelled to follow through with the twist as an action for their next turn. On a failed saving throw, the sentence remains and the Book of Plot Twists cannot be used again for another day.On a successful saving throw, the sentence disappears and the holder of the Book of Plot Twists can try again in one hour, rather than waiting a full day. A target cannot be compelled to take an action that would directly lead to their death or serious injury. It is impossible to rip out or destroy the infinite pages, so reading through this tome may yield some interesting pieces of history. The Book of Plot Twists does not like run on sentences. Also check out this awesome list of destinations made by u/drouu!